Eva Sonaike is a London-based lifestyle company using African prints and African inspired textiles to create beautiful fabrics and luxurious accessories for home décor, fashion and interior design. Our mission, 'Bringing Colour to Life' is reflected in signature collections of cushions, bags, notebooks, footstools, fabrics and furnishings, combining the richness of the African aesthetic with the finest velvets and leathers. Creative Director Eva Sonaike graduated with an MA in Fashion from the London College of Fashion, where she specialized in contemporary African fashion and African textiles. She then pursued an editorial career working as UK Fashion Editor for Hubert Burda Media for five years, working for German Elle, InStyle and Focus. 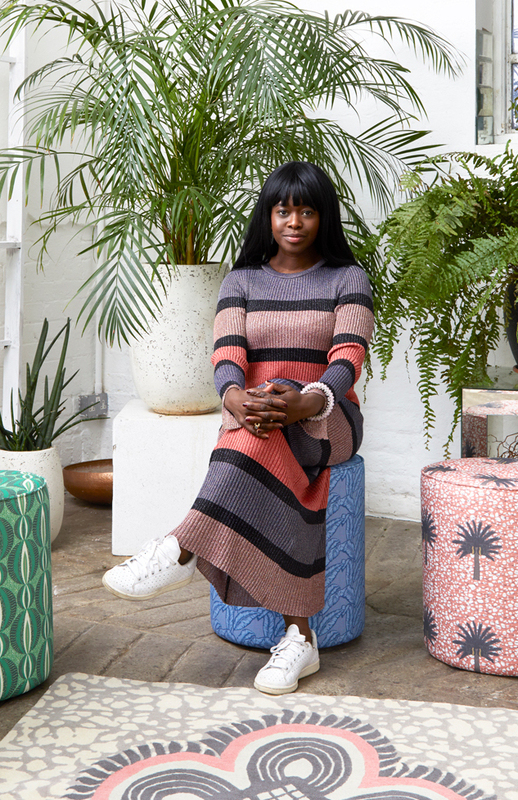 Driven by her enormous passion for colour and African print fabrics, she began producing cushions with African wax fabrics as a hobby, and then gave up her journalism career to focus full-time on building the Eva Sonaike brand. Eva, who was born and raised in Germany and is of Nigerian origin, has taken the best elements of European and African cultures to inspire her work. Her designs draw from the two distinct influences of colourful African clothing culture and European antique and mid century furniture traditions. Emphasis is placed on hand finishing, distinct designs and high-quality manufacturing. All our products are manufactured and printed in England. The Eva Sonaike brand is regularly featured in high–end press and media coverage of products with luxury African prints, tribal prints and ethnic prints. Eva Sonaike products have since then been stocked worldwide in such prestigious stores as Liberty, Fenwick of Bond Street and Selfridges in London, Globus in Switzerland, Temple Muse in Lagos, ABC Carpet & Home in New York and Indigo Living in Hong Kong.